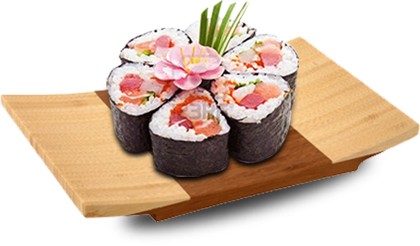 Your new favorite sushi bar in Tampa, Oldsmar, Clearwater, Palm Harbor, and all of Tampa Bay. 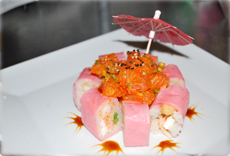 Tempura shrimp, cream cheese, krab delight, asparagus, wrap in Pink soy paper. Top w/ special spicy salmon mix center & garlic teriyaki sauce. 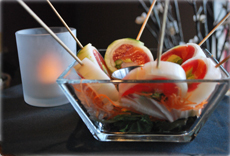 Tuna, salmon, Krabstick, aspar, avo, scallions, smelt roe, wrapped in cucumber sheet w/ side of sunomono sauce. 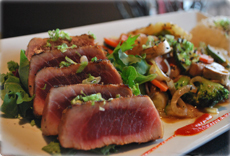 Sushi grade Ahi, seared to perfection with Asian seven spice & Miso - garlic drizzle. Krab delight, temp shrimp, asparagus. 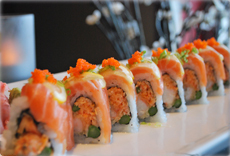 Top w/ salmon, lemon, scallions, tobiko & Sunomono vinagrette. Copyright © 2013 HotTuna. All rights reserved.